In bird photography, like in many other things in life, timing is everything. A common migratory bird, perching uneventfully atop a bamboo pole by a fishpond, was pushed off-balance by a sudden gust of wind. The Canon 7D’s sensitive shutter button, almost instantaneous AI servo AF and 8 fps burst allowed me to grab an interesting frame from what was an ordinary looking scene moments before. Habitat – Bays, tidal flats to ricefields. Shooting info – Binmaley, Pangasinan, Philippines, April 22, 2010, Canon 7D + EF 400 2.8 IS + Canon 1.4x TC II, 475B/3421 support, 560 mm, f/5.6, ISO 400, 1/2500 sec, manual exposure in available light. 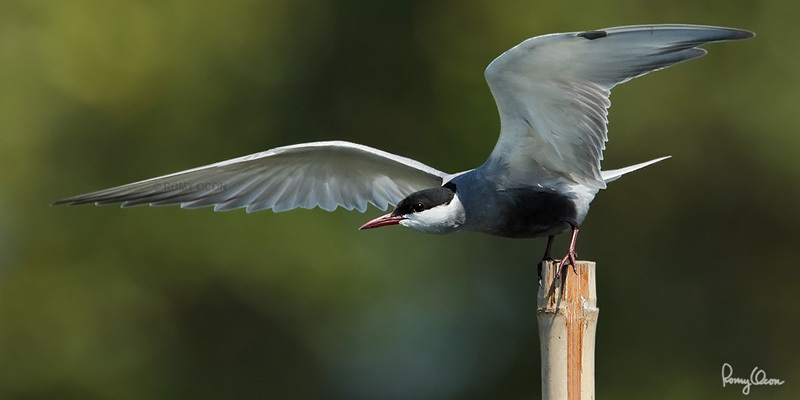 Video of Whiskered Terns in flight.